Irma Cicak, Burlington High School senior, speaks during the protest. 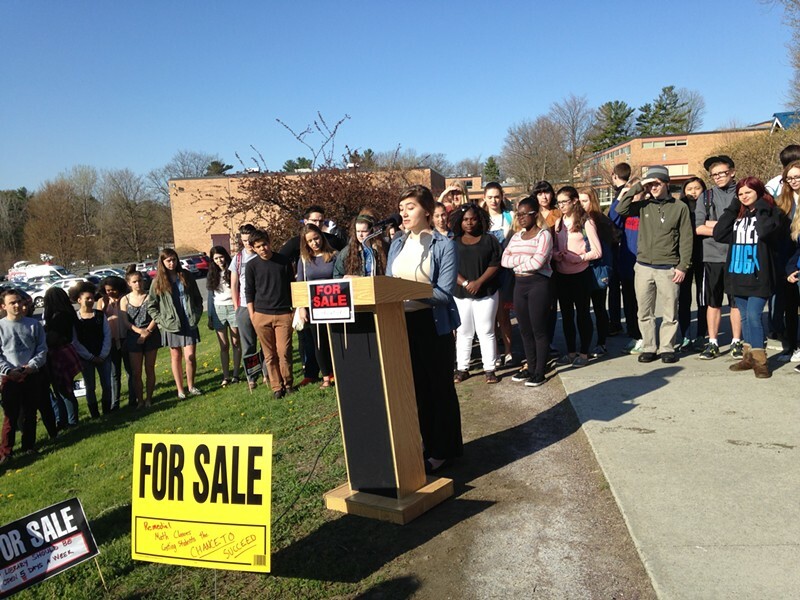 Burlington High School students jumped into the heated city debate about course cuts and teacher layoffs with a unique demonstration Wednesday. 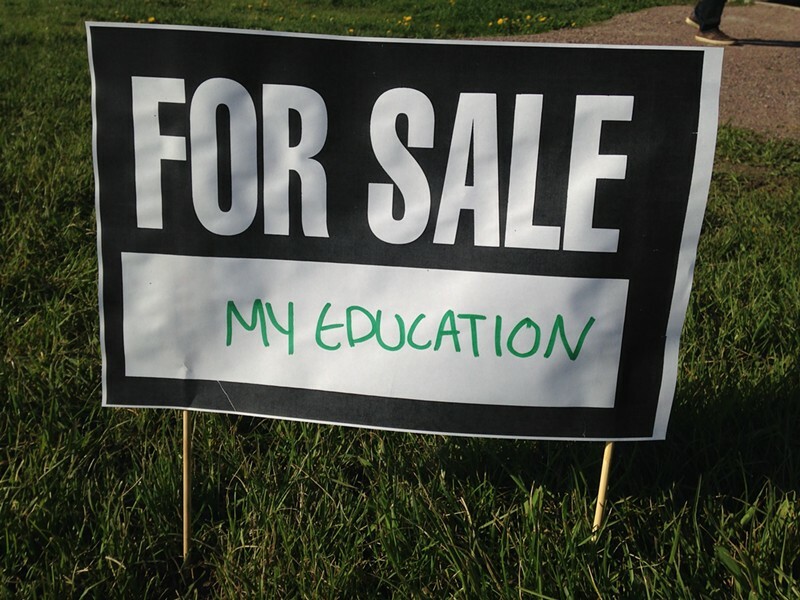 They planted hundreds of “FOR SALE” signs on school grounds, each bearing hand-lettered messages that expressed their frustration. Joking aside, students are worried. “They think their education is pretty much being thrown out the window,” said Riann Gianni, 14, a ninth-grader who participated in the early morning demonstration before school. Gianni made several signs, including one that mourned the cut of AP French from the high school offerings next year, as the district struggles to close a budget gap. Students who score well on AP course exams can earn college credits and in some cases improve their odds of acceptance to competitive schools. Gianni wants to live in France someday and had hoped AP French would help her become fluent. She’s also concerned about potential cuts affecting students who need remedial math and other catch-up classes. “Some of those classes are also being cut,” she said. Eliza Abedi, a 16-year-old sophomore, said she loves BHS but worries that incoming students will have less opportunity than she’s had. 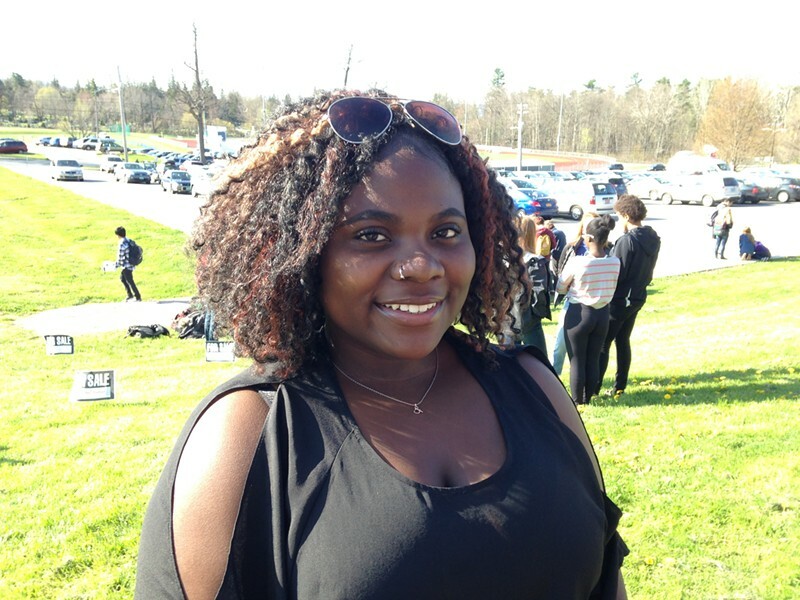 Abedi wants to take at least five AP classes by the time she graduates and believes this will help her get into her top-choice college, New York University. The announcement last week that longtime principal Amy Mellencamp will be reassigned next year to be principal of C.P. Smith Elementary School was another source of worry to students, and seemed to happen out of the blue, Abedi said. “It just gave us a major shock and we’re so upset,” she said. At a school board meeting Tuesday night, many parents complained that Burlington superintendent Yaw Obeng’s decision to move Mellencamp was punitive, cruel and unfair. They also criticized the major shuffling of principals around the district, saying it was a top-down decision with no community input. And while many speakers shot arrows at the board and Obeng, at least one praised his vision and effort to control tax increases after years of big hikes, deficits and financial problems in the district. It’s important to remember all the people who have begged the board to “do something about property taxes,” said Suzy Comerford, noting that her property tax bill is around $8,500 annually. “The district was a mess,” she added. Comerford said Obeng deserves thanks and encouragement. “We need strong leadership,” she said. At the demonstration Wednesday, parents and and at least four school board members studied the signs and chatted with students. 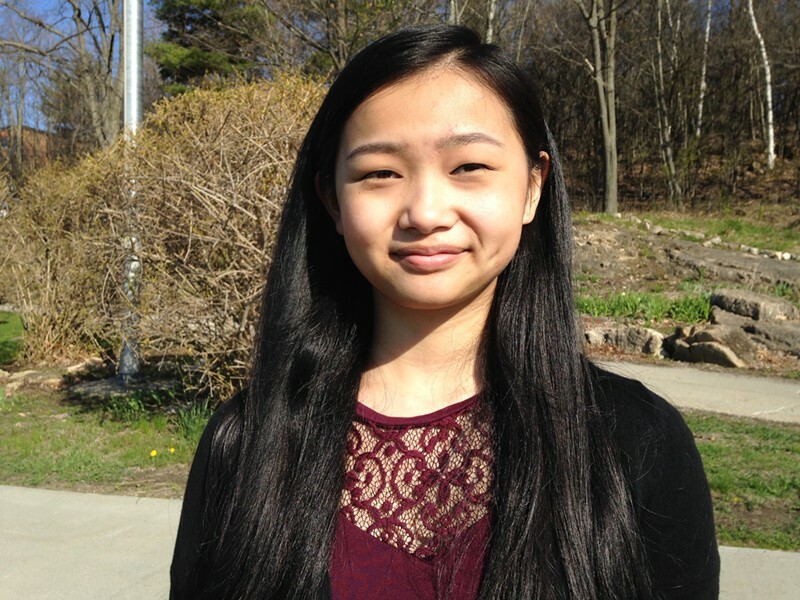 Senior Irma Cicak, 17, who will attend the University of Vermont in the fall, conceived of the idea for the protest. Some of the signs were based on inaccurate information and rumors, reflecting the lack of communication about the changes from school leaders, Cicak said. School leaders have given unclear and sometimes contradictory information about what courses and services will be cut, adding to confusion. That continued Wednesday, with Obeng and BHS principal Mellencamp disagreeing about what’s being cut. Mellencamp has said that AP Spanish and French, Latin III and IV, Physics II and some remedial math courses would be cut. Many parents and students are also under the impression that the Burlington High School library might not be open every school day. She also said that the BHS librarian, who has been full-time at the school, must now split her time with Hunt Middle School, creating a quandary. “We can’t just have the library open with all the equipment and books unsupervised,” Mellencamp said. Foreign language AP courses will still be offered at the high school, but with reductions, Obeng said — contradicting Mellencamp. Student sign-ups will determine which are chosen. This year, according to Mellencamp, 16 students took AP Spanish. Only 10 took AP French. He confirmed that Latin III and IV will not be offered, at least as of now in the scheduling revamp. “Right now we’re able to say we can offer Latin I and Latin II. But the process is not finished. This is just the first page,” he said. Obeng said an additional section of AP biology has been created for next year to accommodate students who had initially been shut out. And in a memo that he wrote this week, Obeng clarified other questions. Guitar and AP world history classes will be cut; but a new earth science course will be offered as well as a new reading and writing workshop. His memo said an additional calculus class would be offered. But Mellencamp said the offerings are going to be the same as this year: AP calculus, calculus I and calculus II. “There’s no increased offering,” she said. Correction, May 12, 2016: Burlington High School does not offer AP German. This post has been updated to remove an error.